Netflix released a teaser trailer for Jessica Jones season 2 over the weekend, along with a release date: March 8, 2018. It gives us a glimpse at what to expect from the superpowered alcoholic private investigator – played by Kristen Ritter – in her new standalone chapter, over two years after we first met her. There's even a jab at Spider-Man's iconic line towards the end. The one-minute teaser doesn't give away much, with shots of Jones back doing investigative work, jumping from high distances, breaking down doors, and drinking a lot as always. Other series cast members will also return, including her best friend Trish Walker (Rachael Taylor), who wants Jones to learn more about her past, neighbour Malcolm Ducasse (Eka Darville), lawyer Jeri Hogarth (Carrie-Anne Moss) and Kilgrave (David Tennant). New York City private investigator Jessica Jones (Krysten Ritter) is beginning to put her life back together after murdering her tormenter,Kilgrave. Now known throughout the city as a super-powered killer, a new case makes her reluctantly confront who she really is while digging deeper into her past to explore the reasons why. New cast members include Janet McTeer and J.R. Ramirez, the latter of whom plays a single father who moves into Jones' building as the new superintendent. 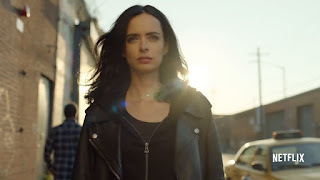 Though it's been over two years since the first season, we did get to see Jessica Jones in The Defenders earlier this year, with Ritter being one of the few bright points. Expectations are high from Jessica Jones season 2, given the show's first year was one of the best, if not the best, season of any Marvel-Netflix series. We'll know how it fares come March 8, 2018.